Here’s a model that can help in understanding depression, addictions and self-esteem issues. The model’s both old and new, deriving from ancient reflective practices, as well as from Jung and beyond, up to contemporary psychotherapy. Although the model may not be the one answer to (for example) substance addiction (which is, potentially, a complex response to external as well as genetic and psychodynamic factors) it’s presented as an invitation to reflect on whether there’s value in it for you. And it could form part of an inquiry undertaken in personal counselling or therapy. Spiritual traditions both East and West have spoken for millennia, in different ways, of the “Self” – as the Ground of Being, as Source, Tao, the Divine, Brahman. In this view, our (largely unconscious) oneness with the Self is a deeply loving embrace, a primordial unity of the individual sense of ourselves with an Infinity that is unnameable and deeply grounding. It’s a sense of absolute peace and completeness. What can go wrong? Well, it seems that for us as baby humans, this sense of Self needs to be mirrored back to us by those closest to us in the world. We need to feel that we are loved by those figures from whom we have not yet psychologically separated: our parents and/or care-givers. A wounding of this loving embrace, the hurt of not being truly met, is enough to cause us loss of this sense of Self. This loss can be very deep for the infant. The infant may begin to develop strategies to make such unbearable loss bearable. They may begin to make up an identity for themselves, one that better fits their world. This making of an identity, as different from what is naturally ours, we could call “going it alone” (or attempting to do so), without the backing of the Self. For example, an infant could choose to not have needs, or could choose to be avoidant of contact with others. This is how psychological disorders can develop. When the infant or child decides to “go it alone”, they depend upon strategies of their own making for psychological survival, rather than upon the primordial peace that still envelops them. It’s not that the child has actually lost their ground; the problem is that they believe that it’s been lost. This “going it alone” can be experienced by some as a contraction (the world is on my shoulders), felt so strongly (but not understood for what it is) that it causes a deep sense of guilt over what they have done – which was to deny their primordial peace and completeness. 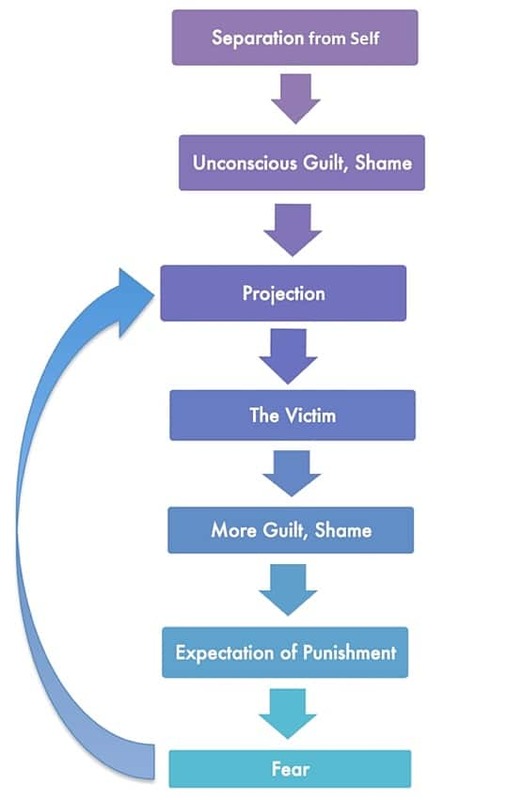 A guilt so disagreeable in fact that the individual pushes the guilt out of their awareness – where it lives an unconscious life, as an energy ready to be activated. The person is left with an indefinable sense of great loss; a sadness that can never be fully understood because its activating roots have been pushed so far out of awareness. This sadness can play out in many ways in the world, not all of which may look sad! One of the ways it can play out is as a grinding sense of shame. Where guilt says “I did something wrong”, shame says “I am Wrong”. Some practitioners use the term “ground shame” to refer to a shame that has lost all contact with specific scenarios or experiences: what’s left is just an endless “knowing” of wrongness. One way out of this painful situation for the individual is via the psychological mechanism of projection. We can attempt to alleviate the negative effects of guilt and shame by judging others, by projecting the awful feelings as far away from ourselves as possible. We can develop an endless system of judging others and judging events in the world. We end up exacting our grievances on anything we consider to be “outside” of ourselves. It becomes the song of our everyday consciousness. We learn the stance of “victim of the world”. Everything would be better if just this … (outside of me) would change. Then I would no longer be a victim of it. Acting out our grievances is very likely – using violence, depression, or even our sexuality, as examples. At some level (usually, again, unconscious) we feel guilty for all this finger pointing or acting out we’re doing. It leaves us with a bad taste. We decide we’re “not a good person” for habitually doing this. Our original unconscious guilt and shame for having left Home is compounded by our actions to cover up what we originally did. Burdened by this sense of guilt, it’s a small step to expecting that we’ll be punished for what we did. Doesn’t the whole world work on the basis of punishment following crime? On revenge? So we live in fear; again, not in a fear we can necessarily put our finger on, but maybe with a lingering sense of anxiety; or with a protracted depression; or with an acting out in addictions or in an eating disorder. In acting out our fears we undertake more projections and more judgements. How can we get clear of these habitual negativities? Only (we think) by more of the same behaviour. We think that maybe the “good” is out there in the drug, the drink, the food (projections). Maybe (we think) by consuming this “good” I can have back the primordial Good – that which I already had at the beginning, my original Home (which in fact I actually still have, but I don’t realise this to be the case). In our counselling practice, our experience is that people can find a way back to Self. They can find relief from this negative cycle of guilt, shame, fear and projection. And it sometimes takes just a willingness to investigate habitual defenses to find relief. There’s potential magic in reflecting upon these habitual defense systems, and in bringing them to the light of conscious awareness. The shared space of the psychotherapy / counselling setting can be the ideal place for exploration.